Dastra Brand Carving Tools - Made in Germany by the same family since 1835 with a patented formula steel, forged, ground, heat treated and polished to exacting standards to take and hold the finest cutting edge possible. Chisel is about 5-1/2" long, making it comfortable and easy to control while doing delicate and precision lock or trigger inletting jobs. We've been using the same set of Dastra chisels for over 30 years for gun building and other woodworking projects. 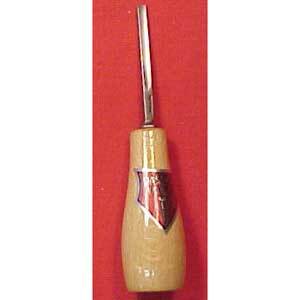 Dastra Gouge Available in 4mm No. 66W2044 or 6mm No. 66W2046.